Notwithstanding the n times in which I tried to "convince" our resident programmers that the Windows Registry is a filesystem, and that thus a filesystem driver was the "right" way to access it, nothing was done about it. 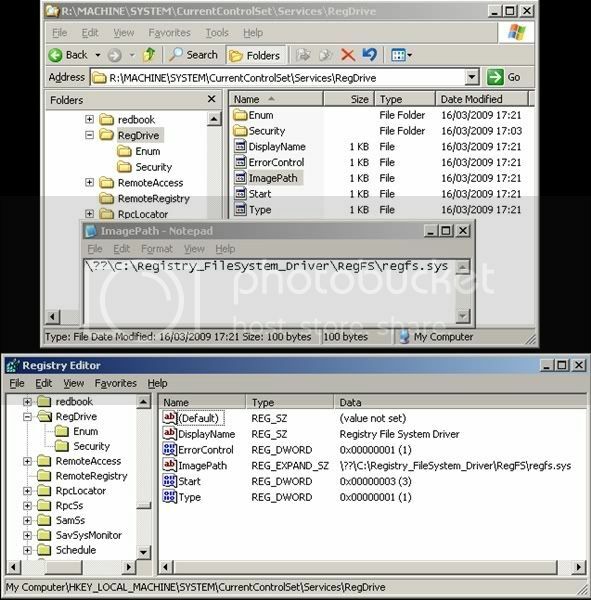 The registry interface is very similar to the filesystem interface in that they are both hierarchical databases that have data-less nodes (keys/directories) and data leaves (key values/files). Unforutnately, the registry is accessed through an entirely different API than files are, which can be a pain in portable software, especially those designed to edit and transfer configuration, expecting the data to be stored in files (like it is on most other OSes).Regfs provides a filesystem interface to the registry, allowing programs that aren't aware of the registry to access it anyway. Even though the interfaces are similar, there are differences between the registry and a standard filesystem that may not be reconcilable; Regfs is NOT designed to be a general-purpose filesystem, as there are important features that cannot be implemented and interfaces differences that may be difficult to work-around at best. (See the known issues) Instead, regfs should be used to access and store basic configuration information in a unified place for all apps-- even those that don't normally use the registry. In any case, RegFS is an interesting as a NT filesystem interface wrapper. Would it be too much to ask any of the programmers with a DDK to compile it, in order to try it? Since the first release of Windows NT, security descriptors have been used to control authorization for system resources in a unified way. Security descriptors can be applied to every file, key, process, thread, event, mutex, semaphore, desktop, job, section, Active Directory object, and many other object types that exist on a NT system. The original security descriptor editor that shipped with NT 3.1 was barely functional. Even the new editor introduced in Windows 2000 has limitations. SD Edit is designed to expose the full functionality of security descriptors by presenting them in a direct form and by giving you full control over the details. It presents the elements of a security descriptor in a more direct form than the shell editor, and so requires you to better understand how they work at a low level. The registry is fuzzy, this driver will hide some of these features to make it acessible. For example, a registry key is an object that can both contain data and also contain links to it's sub-keys. On a typical file system logic you'd want to have folders and files, not both mixed together..
Have you compiled and tested the driver? Or are you using your mouth fingers without checking that a proper connection with your brain has been established? Not really sure, it's been a while since the last time I dwelved into these things but this just feels wrong. Come on.. besides the limitations already mentioned by the author, how do you create a new data value? How is the value type defined? Which then makes me wonder how does one define the type of cell that a folder should have other than default? And what happens when you copy over files to the mounted hive? Will they be automatically sorted as DWORD, HEX (each variant) or strings? If the file has more than 64Kb will it be truncated or split onto several smaller files? These are some of the questions that roam my head without compiling or running the driver. Some feedback regarding how to solve these questions would surely be welcome! In the time that it took you to wonder about those questions you could have built the damn thing and have a look directly at the existing and missing features. Let's see how many more "programmers" will post something critical or speculative here while avoiding the only thing that I (hopefully in a gentle and kind manner) tried to ask as a favour. That does not make sense. Where is the name of the driver? Tried 3 different ddks. Finally found one it compiles with - w2003 sp1. Regardless neither the included or the one I compiled installs. sc create service failed 487 error reported from sc ( attempt to access invalid address ). We tried this driver on a test-machine at work, and it's exactly like the author states : only usable for non-intensive adding of keys/values when you can live with the shortcommings of missing functionality. For more intensive work it's hellish slow and when the registry is bulked and huge due to.. well.. no maintenance etc etc, it never failed to BSOD the machine. While the idea is fun: I can't see the driver practically deployed anywhere for a serious job, even when further developped for the sole fact that thru the API is far more faster. An inf file to install the driver should also be provided. Sorry, didn't want to become an annoying critic. Will try to provide feedback more positive to this discussion. I managed to build it and install it. Once started the R: drive letter is immediately available, you need to kill and restart Explorer to have it in Explorer. Now what is missing is the equivalent to what VDK.EXE is for VDK.SYS, an install/configuration utility (and the ability to change drive letter and to mount an off-line Registry). Judging from the help and support I got till now, this will never happen. I did finally manage to install it. Don't really see what you gain. Viewing values appears to only work with notepad and really only works with string values - multistring values don't show correctly. Forget it for binary / dword etc value. Other editors like notepad++ don't work. To use it you need to write a viewer program. What benefit do you get over using regedit directly? Don't really see what you gain. Jaclaz's idea to have a different mechanism to write registry values in WinBuilder is not bad. The existing one works very well but is not really very fast. Too bad that the file system driver is even slower. Jaclaz's idea to have a different mechanism to write registry values in WinBuilder is not bad. Just for the record, it's not my idea, it is not necessarily related to Winbuilder, and it is not even an idea: it's a plot, a conspiracy against the Registry, the BCD store and, more generally the stupid way in which MS implemented the Registry format without giving decent apps to access it and documentation about the format used. 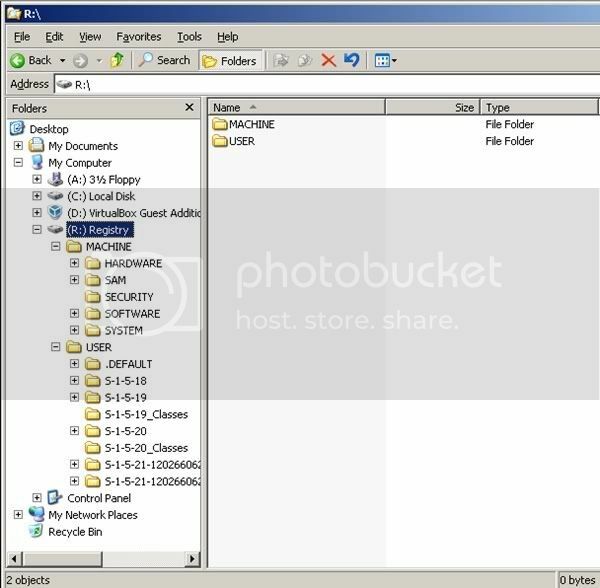 A Registry (offline) mounted as a filesystem to a drive letter would allow to use, for example, batch files on the contents, adding or replacing keys, and the like. I find that speed is not the main problem. Anyone ever thought of rather misusing what M$ offers, instead of reinventing the wheel? I can see no reason, why it shouldn't be possible to have two Registries. I think all that would be required is to patch the hardcoded path/address. Unfortunately, that won't work with registering of dll and services. But importing of reg files should be fine. Thinking of it. WB style registry operations probably also won't work, unless the API calls are replaced by costum routines. PS: For all those who wanna know, how the registry commands work. Don't know about Delphi, but usually one can read up stuff like that, in the sourcecode of the used library. The regfs driver is still using the native Zw registry access api's - its not accessing the hives directly. The normal windows registry api's in advapi32 are just a thin layer on top of the native registry api's to make them easier to use and to be accessable from user mode. Also does not seem to be any documented way in the native api to load a remote registry hive. It must however be possible as advapi32 does it.Other problem with the native api is that documentation for it is very poor. Interests:Far too much to mention. Including: Gaming. PHP. Budabot. USB Booting. Reading. There are plenty of reg tools out there... some freeware, some not. A lot of people rave on Powershell, which has some damn useful tricks up it's sleeve. beleive it or not. Most can be scripted. Be suprised what you can get up to with the right version of Regini. I'm the author of Regfs and SD Edit, and I just found this link to my website and wanted to respond, hoping that the thread hasn't become too old. I always wanted to get into filesystem drivers, and thought this would be a fun project. It's not really finished (as you can tell by the hard coded paths and lack of installer and beta label). The registry just stores blobs of data internally, with a 32 bit length. All data types, including DWORD, string, multi string, etc, are all stored as opaque blobs. This is also the way they are accessed through the native API, which Regfs uses. The "type" is just an extra ULONG associated with each value. It can be any value; the registry engine doesn't care and doesn't do anything with it except store it. Neither does Regfs. However, the Win32 Reg* functions in advapi32.dll DO use the type to change the way the data is processed. Strings are always converted to UCS-2 Unicode before being stored, and are read as null-terminated even if they really aren't (with some caveats) There may be other things, too. The filesystem interface doesn't really have a metadata for this (instead, file types are part of the name, e.g. exe or txt). Regfs does expose the type through extended attributes, which is a clean interface, but almost no programs support. NTBackup does, and you can save keys and restore them elsewhere with types preserved (not that I would recommend this). I did have plans to have an option to overload the file name extension to map to registry value types, but haven't implemented it yet. If you don't specify a value type (via EAs) when creating a new file, you get DefaultKeyValueType = 0, REG_NONE. I've been using WDK 6000 to build the working version, which includes the IFS. Values are not limited to 64k (one of my tests is a several MB paint image), but values can only be written all at once so the driver has to buffer the entire value with pool memory. Large values (<1 MB) are not recommended. Remote registry is implemented entirely in user mode, between advapi32.dll and the remote registry service. Regfs can only access the native kernel APIs. Your Registry filesystem driver, once it will be able to mount an "offline" Registry and when the small quirks still in it will be finished/polished will be the best discovery (after icecream and KON-BOOT)! I just discovered that Cygwin (a collection of tools which provide a Linux look and feel environment for Windows) offers read only access to the Windows registry via a filesystem. # Location of the read only Windows Registry. # List key of programs that startup automatically. # Read Java updater key. could this insight not for ReactOS be interesting ? Good post Icecube (Cygwin access to registry). Might try it at some point. Blacky, good also. I have just discovered NTobj in ROS Explorer.